On December 16, the Upper Valley Land Trust and landowners Graham Colditz & Patti Cox conserved over 250 acres of scenic and productive land on South Road in Canaan, NH. Like many properties UVLT has protected, this land has deep roots in history. Every property has a story but the story of this land is particularly special. Its journey from early settlement in 1766 to its conservation in 2011 is traceable with an unusual amount of detail and continuity. Thomas Miner and his wife had seven more children in Canaan and lived to see the town grow around them. 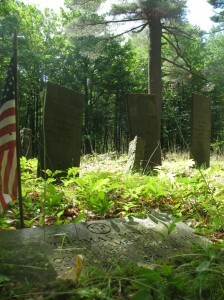 They are buried in the historic Cobble Cemetery which exists within the conserved property. Thomas Minerâ€™s grave is marked with a modern headstone commemorating his military service in the Revolution; the town places a flag at his grave every Memorial Day to honor that service. The historical farmstead has been restored by the current landowners and cattle still graze the fields. The forests are managed as a certified New Hampshire Tree Farm and streams that enter Gulf Brook and the Indian River add to the diversity and richness of the natural resources on the property. With proximity to other conserved and public lands, including Mount Cardigan State Park, this special place contributes to the traditional rural character of Canaan. Graham Colditz & Patti Cox are proud to conserve their property and ensure this land and its history remains intact as a place of inspiration and wonder for future generations. Volunteer Monitoring 101 Lessons One & Two – The Art of Taking a... Art in the Wild Returns for 2012!